The #1 rated event of the IIHF Top 100 Stories of the Century took place 33 years ago today, the "Miracle on Ice" game at the 1980 Olympics between the United States and the Soviet Union, who had won five of the previous six Olympics and 14 of the previous 17 World Championships. Clearly no one thought the United States had any chance to win. The Soviet Union was able to ice a team made of highly experienced, veteran hockey players since they were able to exploit the existing rules on amateurism by classifying their players as soldiers in their military, who just happened to be assigned the duty of playing hockey without being paid to do so. This meant the Soviet roster consisted of ten players over the age of 25, five of which were 30 or older battle tested, highly skilled men who had captured enough gold medals and trophies to fill a museum twice over. In addition to their experience and much higher average age, the Soviet players trained 11 months out of the year, confined to a compound away from their families. 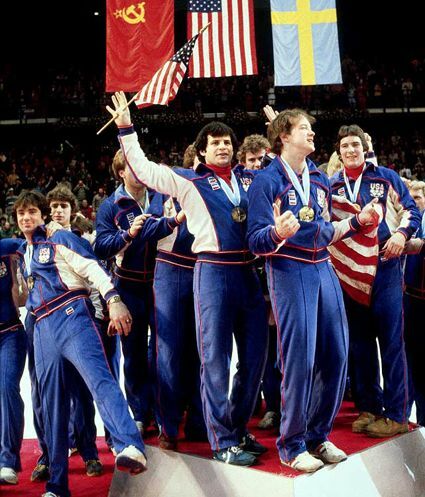 Meanwhile, the Americans, famously referred to as "college boys", had only been brought together the previous summer and had just two players as old as 25, Buzz Schneider (the only player with any previous Olympic experience) and team captain Mike Eruzione. The entire remainder of the roster was between the ages of 20 and 22, save for teenager Mike Ramsey, 19, who was 16 years younger than Soviet captain Boris Mikhailov. 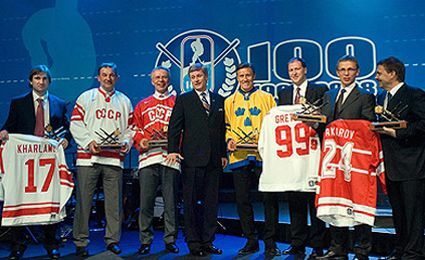 Aside from the accomplished Mikhailov, who had already won two Olympic and eight World Championship gold medals, the Soviet Union also boasted such names as the legendary Valeri Kharlamov (2 Olympic and 8 World Championship gold of his own), Sergei Makarov, Viacheslav Fetisov and, widely considered the best goaltender in the world, Vladislav Tretiak (2 Olympic and 7 World Championship gold prior to 1980), all of four of whom would be named to the six member IIHF Centennial All-Star Team. Let that sink in for a moment. Four of the best players in all of hockey anywhere at any time over the last 100 years, were on the same team at the same time - and they were facing a team of players who had a combined zero games of NHL experience. None. 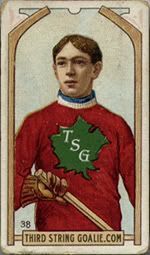 This was essentially the same team which had defeated a team of NHL All-Stars 6-0 one year earlier and crushed the "college boys" 13 days earlier in a final exhibition game prior to the Olympics by a score of 10-3. Despite the Soviets taking an early 1-0 lead and going up 2-1 just 3 1/2 minutes after the United States evened the score at 1-1. 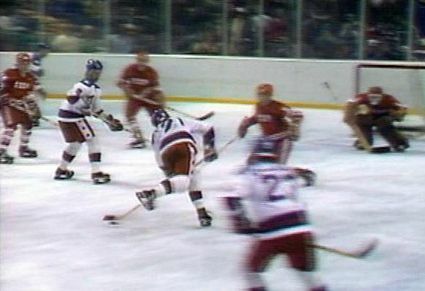 One of the key moments in the game came late in the first period when, with just seconds remaining, Mark Johnson of the United States, playing hard right to the finish of the period, split the Soviet defenders, who may have let up with time expiring, and pounced on a big rebound given up by Tretiak on a long shot by Dave Christian from the other side of the center ice line. Johnson picked up the puck, skated around Tretiak and buried the puck into the gaping net with one second left on the clock to send the Americans into the intermission on a high with the score even at 2-2. 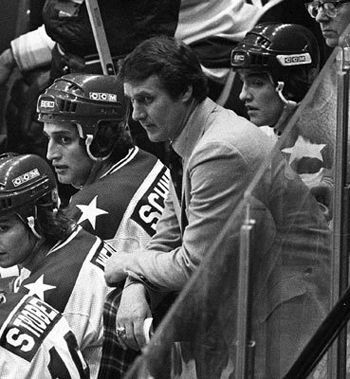 Soviet coach Viktor Tikhinov was so incensed at Tretiak, he pulled him from the game for the ensuing face off to formally finish off the period, which took some time to complete, as the Soviets had left for their dressing room, convinced that the period had expired prior to the goal being scored. While many thought that Vladimir Myshkin had just been sent out to kill off the final second of the period, as perhaps Tretiak had already taken off some of his gear, it was indeed Myshkin who took to the crease for the start of the second period, which caused U. S. head coach and master tactician and motivator/manipulator Herb Brooks to state, "Well, boys, you just put the best goaltender in the world on the bench." It would not take the Soviets long to counter for their lapse, with Aleksander Matsev scoring a power play goal just 2:18 into the second period and Myshkin held the US off the board for the middle period, a feat made pretty simple considering the Soviets held the Americans to just two shots on goal for the period! This meant the Soviet Union was in the all-too-familiar position of heading into the third period with a lead. 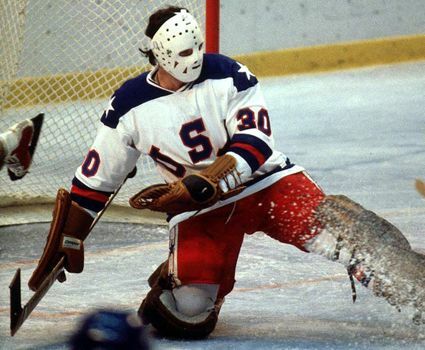 The tables began to turn when Jim Craig in the US goal kept the Soviets from adding to their lead for not only the final 17 minutes of the second period, but the first six of the third, as giving up an early goal in the third period would have been deflating for the Americans. At 6:47 Vladimir Krutov was sent off for high sticking and on the ensuing power play, Dave Silk send a soft puck into the slot, which somehow handcuffed Soviet defender Sergei Starikov, which allowed the opportunistic Johnson to scoop up the puck and quickly shoot it past Myshkin at 8:39, tying the game at 3-3 and electrifying the small, but packed 8,500 seat Olympic Center arena. And then it happened. After a long dump in by Schneider, who then peeled off and left the ice, Myshkin turned the puck away into the corner. There, it was weakly sent up the ice along the boards by a Soviet defender who was being checked at the time. Roughly half way to the blueline, Mark Pavelich, while falling, managed to somehow intercept the puck and backhand it into the center of the zone, where it was corralled by Eruzione, who had come on for Schneider. 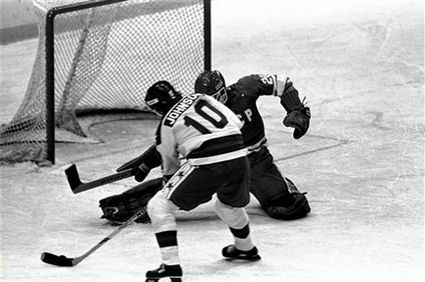 Eruzione then skated around the puck to move from his backhand to a forehand shooting position, and then using Soviet defender Vasili Pervukin as a screen, fired a wrist shot past Myshkin to give the United States their first lead of the game with exactly 10 minutes remaining. Half a period was far too much time to relax against the Soviets, but Brooks now had his team leading after 50 minutes and constantly reminded his young team to "play your game" and keep their shifts short. Craig stood tall in the American goal, kicking out shot after shot as the Soviets pressed for the equalizer. 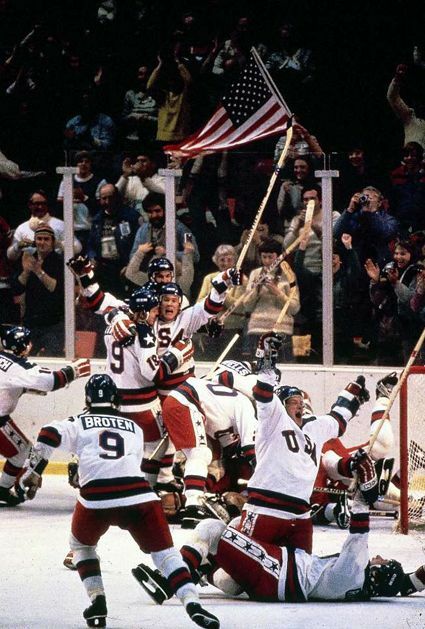 Time kept slowly ticking down and Craig kept making clutch save after clutch save before time eventually ran out on the Soviets and the arena erupted in a euphoric, patriotic bedlam never before seen. With the clock ticking down the final seconds, broadcaster Al Michaels summed it up with his now famous quote, "Do you believe in miracles? YES!" and this game, so unexpected, so stunning, so spectacular and unbelievable, now had it's everlasting nickname, "The Miracle on Ice". As we are often reminded, the United States still had one game remaining against Finland, which they needed to win to secure the gold medal. In fact, it was actually still possible for the United States to finish fourth and come away without any medal! Still, with everything to lose, it would require a third period comeback for the US to secure their coveted gold medals. While many players used their Olympic experience as a training ground and a stepping stone to their eventual NHL careers, Ken Morrow, Ramsey, Johnson, Neal Broten, Christian, Jack O'Callahan and Pavelich, Eruzione knew when to call it a career, having already played two seasons of minor league hockey and knowing nothing could top captaining that team and scoring the winning goal in the game against the Soviets, and he retired as a player following the Games and became, among other things, a successful motivational speaker, prompting Brooks to hilariously quip, "Eruzione never met a microphone he didn't like." 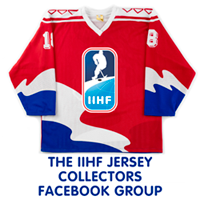 Fast forward to today, 33 years on, and to date only three jerseys from the Miracle on Ice team have made their way into the hands of the public. Some years back Mark Wells gave one of his jerseys to a friend, who had run into financial difficulties and asked Wells permission to sell the jersey. Wells, who was facing medical bills of his own due to issues with a rare genetic disease of the spinal cord, saw what the interest was in the blue jersey from the Finland game, agreed to sell his white jersey as well, which was on display at his brother's bar. 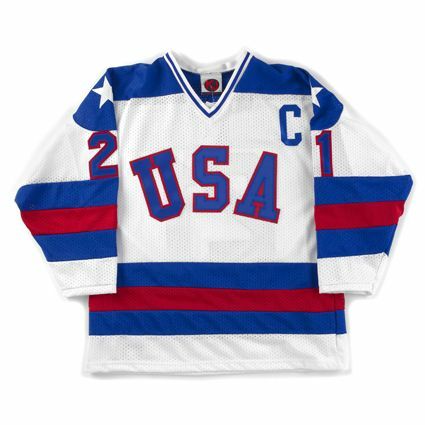 In February of 2012, Morrow put his white Miracle on Ice jersey up for auction on Classic Auctions, the first one to be publicly auctioned off, as the Wells jerseys were sold through private sales. Morrow, who had displayed his jersey at various speaking engagements and charity events, had simply decided it was time to part with many of his saved items and "give people a chance to have a piece of history." The auction, which ended a year ago today, brought $104,328. 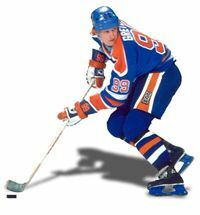 Just in case you were wondering, his blue jersey is currently on display at the Hockey Hall of Fame in Toronto. The $104,000 is a rather impressive amount, but it was still less than the 191,200 paid for a game worn Bobby Orr rookie jersey and far behind the world record $1,270,000 paid in 2010 for Paul Henderson's Team Canada jersey from the 1972 Summit Series worn when he scored the dramatic series winning goal in the dying moments of the deciding Game 8. That jersey was purchased by Mitchell Goldhar, who sent the jersey on a tour of Canada so everyone would have a chance to share it. Which brings us to today, as Eruzione has now decided to part with his his collection to to help out his three adult children after seeing what the Henderson jersey brought and the arrival of a new grandson got him thinking about the future - theirs, not his. "I though this would be a great little nest egg for them for their future with their kids," he stated. He further explained that his gear had simply been sitting in his USA hockey bag in his attic ever since the Olympics! You would have expected that at least the white jersey would have been framed and on display either in his home or his office or that one of them would have found a home in a museum or hall of fame of some sort. Before agreeing to sell his items, he talked to his Boston University college coach Jack Parker, who was supportive. He also talked with O'Callahan and teammate Robby McClanahan, as well as sending text messages to every guy on the team, none of whom objected. In fact, he stated that they are all curious to see what his sells for and thinks it might trigger a number of future sales on their part. Despite parting with several precious items, he went on to state "As long as I'm alive, the gold medal won't be sold. The medal is what it's all about. That's what we played for." Having turned down a lucrative offer of $100 for his white jersey from Mario Lemieux(! 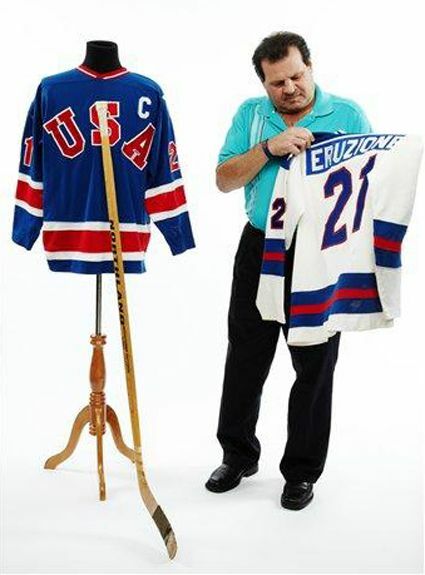 ), Eruzione will be offering many items, his white Miracle on Ice jersey, his blue jersey from the Finland game (pre sale estimate of $200,000), the Northland stick he used to score his famous goal (estimated at $100,000), his gloves, shoulder pads, pants and socks, his gear bag, player credential, his cowboy hat from the opening ceremonies, several other Team USA clothing items, as well as the track suit he wore in the famous medal ceremony - all of which will be sold at auction live and online tomorrow, February 23rd, at Manhattan's Fletcher-Sinclair Mansion in New York City. Also of note in the auction, being run by Heritage Auctions, are a game used and team signed stick used by Craig and the gold medal given to team member Steve Christoff, only the second one to ever be offered to the public, following the Wells medal. Estimates have the Christoff medal selling for $400,000, with some predicting as much as $1 million. 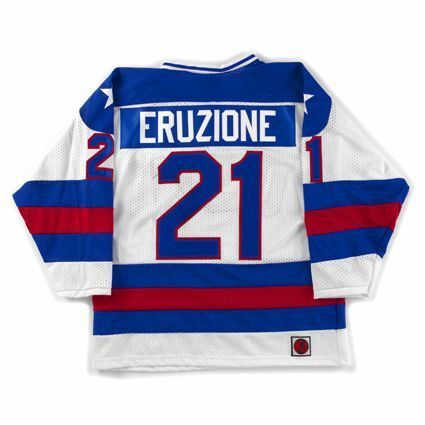 But the star of the show will be the Eruzione Miracle on Ice white jersey, unquestionably THE Holy Grail of hockey memorabilia. 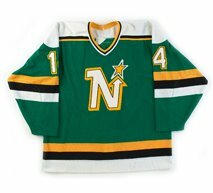 While it is expected to sell for "more than $1 million", it wouldn't surprise us in the least if this iconic jersey were to surpass the $2 million mark with ease. Heck, we don't even think $3 million would be out of the question. When it's all said and done, we, the hockey community, fans of the game and memorabilia collectors alike, can only hope these items find their way into appreciative and deserving hands and they will be cared for and protected, perhaps even finding their way into something such as the Hockey Hall of Fame or the Smithsonian Institution, and they are kept far, far away from any of the card companies who would want to cut them to pieces for the purposes of making trading cards, destroying them forever. 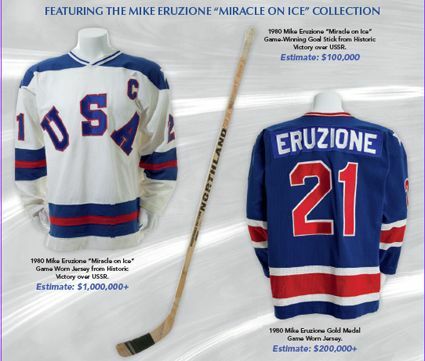 To view the items being sold by Eruzione, click on the photo below of today's featured jerseys, the 1980 United States Olympic Team Mike Eruzione home and road jerseys, two of the most significant jerseys in the history the sport, with the white Miracle on Ice jersey being the likely the highest selling jersey in hockey history in 24 hours time. 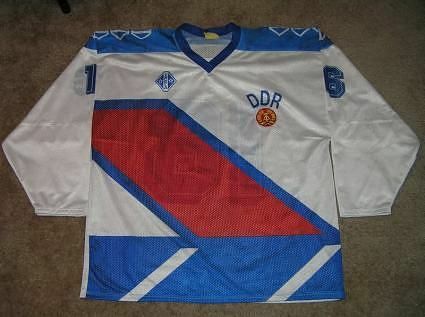 Today's featured jersey is a 1980 United States Olympic Team Mike Eruzione jersey. 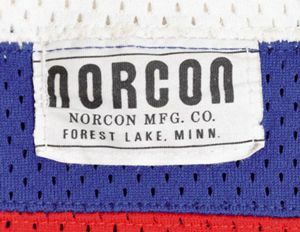 The original jerseys worn in 1980 in Lake Placid were manufactured by a firm from the northern Minneapolis suburb of Forest Lake called Norcon. Even a blank undersized Norcon jersey is a rarity and attracts much interest whenever one surfaces in the hobby. 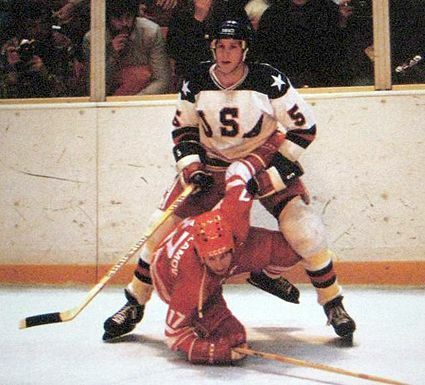 The white 1980 jerseys used in the Olympics feature contrasting nameplates of blue with white letters and USA arched across the front, rather than the diagonally lettered style worn during their pre-Olympic schedule of games played against a variety of college, minor league and NHL clubs. The blue jerseys were made with matching blue nameplates, however. In today's video section, a promotional video from Heritage Auctions about the upcoming auction, which includes footage of the goal against the Soviet Union at the 1980 Olympics that made Eruzione (and his jersey) famous.